Holocaust Controversies: Belzec, Sobibor, Treblinka. Holocaust Denial and Operation Reinhard. Chapter 7: Mass Graves (8). The "Actual" Surface of the Graves. Belzec, Sobibor, Treblinka. Holocaust Denial and Operation Reinhard. Chapter 7: Mass Graves (8). The "Actual" Surface of the Graves. Independently of the unrealistic calculations and considerations by which he tried to demonstrate the incompatibility of Kola’s findings with the mass murder he denies, Mattogno obviously didn’t feel comfortable with graves of such area and volume having been found at all at Belzec. So he tried to put in question the reliability of Kola’s findings about the area of the graves, invoking the robbery digs also mentioned by Kola as his key argument for this purpose. There was robbery digging in the area over a period of 20 years after Judge Godzieszewski’s investigation in October 12, 1945, and these diggings "took place in total disorder, without any regard for orientation, order, or symmetry, which explains the total lack of orientation, the confusion, and the irregularity of the graves identified by Kola", whose drawings show that "the individual graves nearly always show a highly irregular bottom, with bumps and holes", which is "evidence of the activity of wildcat diggers, certainly not of excavations of mass graves aligned in military fashion", while the core samples show that "there is often a difference between samples in a single grave, with very thin and very thick layers", which "can only be explained by the inclusion in the grave of soil from an area that did not initially belong to it". Kola supposedly failed to take these "facts" into account, and because of this "the layout he gives for the graves is completely random, as is their surface area, their volume, and even their number". Contrary to Mattogno’s accusations, Kola’s team was well aware of the difficulties created by postwar robbery digs in identifying the mass graves at Belzec, and can thus be assumed to have duly considered the possibility of a modification of the original shape and/or size of the graves due to robbery digs. Thus the observed damages to the original grave structure in the area between graves 12, 13, 14 and 24 are expressly mentioned in the description of grave # 13. Moreover 26 out of the 33 graves identified by Kola have a regular geometrical shape, which can hardly have been the work of robbery diggers, and in six irregularly shaped graves the original regular shape that was later modified can be made out. As to the bottoms of the graves, the only ones in which the author could make out "bumps and holes" are graves nos. 8, 14 and 20, which are expressly mentioned by Kola as having resulted from a connection between previously neighboring graves. The bottoms of all other graves, as the author sees them, are shaped either like a tub with a fairly regular bottom or like a swimming pool progressively deepening towards a certain spot. These shapes may be related to the composition of the soil at Belzec, which was made of sand or sandy loam and would thus make steep rectangular walls unadvisable as these would more easily cave in. It should also be borne in mind that SS personnel of Aktion Reinhard were not military trained specialists in grave digging, but predominantly non-military supervisors who had previously worked in the Aktion T4 murder program, and were gaining their first experience in organizing and running an extermination camp. If indeed there is "a difference between samples in a single grave", as Mattogno claims to have made out, this may just signal that the alternating pouring of cremation remains into the graves (when these were backfilled after exhumation and burning of the corpses) did not always occur in layers equally thick and/or equally distributed throughout the grave. And the "inclusion in the grave of soil from an area that did not initially belong to it" is also hardly an indication against the accuracy of Kola’s finds, insofar as the SS need not have refilled the graves with exactly the soil that had originally been taken out of them. In response to the deconstruction of his above-mentioned claims, Mattogno complained that Kola’s allowance for modifications of the original grave structures due to subsequent factors like robbery digging did not translate into a quantitative reservation as to the number and volume of graves he established – true, but probably related to the difficulty of establishing said quantitative effect plus the not unreasonable consideration that this effect must have been minimal, as backfilling, covering up the traces of the camp and robbery digging (especially with pits as small as the one shown in Image 7.1) could cause grave walls to collapse only between graves that were very close together. Mattogno furthermore claimed that "the geometric forms of the mass graves delineated by Kola does not constitute factual data, but are merely arbitrary conjecture." In support of this claim he did a somewhat puerile dot-connecting exercise, which supposedly demonstrates that the outlines of the graves drawn by Kola are "purely fictitious and do not correspond at all to the result of the drillings." Mattogno obviously made things easy for himself, especially failing to take into account Kola’s information about the number of drills that were used to estimate the shape and size of a mass grave in each case. Taking this information into account helps to group (to the extent permitted by the accuracy of Kola's map of core drillings and the author’s poor drawing skills) the dots presumably corresponding to drills on the basis of which Kola estimated the shape and size of each mass grave into units that a) bear some resemblance to the mass grave shapes shown on page 19 of Kola's book and b) match the number of these shapes (33). This alone already shows that Kola's estimating the shapes and sizes of the mass graves on the basis of his core drilling finds was not nearly as "arbitrary" as Mattogno would like his readers to believe. Mattogno’s last straw in this context was to invoke the map drawn by former SS-Unterscharführer Robert Jührs, which shows only one area of mass graves in the camp’s north-western corner. From this one is apparently supposed to conclude that those of the graves identified by Kola that are not in the area of what Jührs called the "field of graves" (Gräberfeld) – nos. 1, 2, 3, 4, 5, 15, 18, 19 and half of grave no. 14, with a total volume of 7,775 cubic meters, according to Mattogno – were not graves made to bury corpses during camp times but holes that subsequently came into being and into which cremation remains (and apparently also the whole corpses found by Kola in graves 1, 3 and 4) somehow made their way from the original graves. 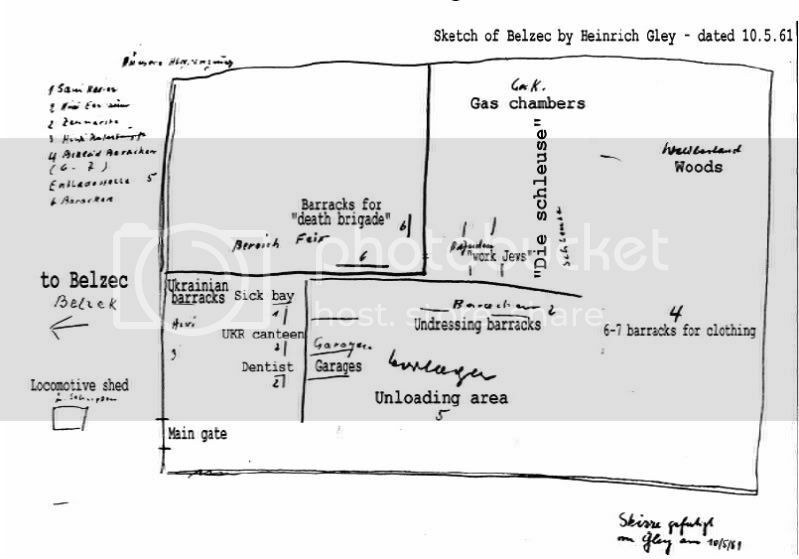 By this somewhat-less-than-logical reasoning, one would have to conclude that the sketch made by SS man Heinrich Gley in 1961 (image 7.18), which is even more incomplete than Jührs’ in that it shows no mass graves at all, means there were no mass graves at Belzec during the camp’s operation – yet it was Gley who provided a detailed description of the emptying of the mass graves and the burning of the corpses. Thomas Kues surmised another "possible cause of grave pit enlargement" besides robbery-digging, the downhill movement of human cremation remains in a south-westerly direction from the mass graves in the northern portion of the camp area during heavy rain falls due to an absence of tree cover. This problem is reported to have occurred when all the trees on site were removed and their roots killed as part of the building of the new memorial site in 2003/2004, and Kues speculates that it may also have occurred in the postwar period and "caused the enlargement of the soil volume containing human remains, half a century later leading Kola’s drills to detect (yet) larger graves than were originally present at the site." To his credit, however, Kues readily acknowledges that the extent of this presumed phenomenon is unknown and "might be not very significant", in which he is probably right: while one can imagine cremation remains lying in upper soil layers to be swept downhill during heavy rain falls (certainly a reason of concern for memorial-builders wanting to protect the remains in the soil against perceived desecration), the downhill movement of whole layers of soil and cremation remains up to 5 meters deep, moreover maintaining the regular geometric shape that most of the identified Belzec graves have, is somewhat harder to fathom. People from the local area suspected that the Jews might have buried valuable items in the ground where the camp had once been. Shortly after the departure of the Germans and Ukrainians they came flocking to dig over the earth. The stationmaster observed how a local road builder staked out an area of about fifteen square meters and dug up several gold rings – including wedding rings – and gold coins. He said they now belonged to him. In trying to overstate the impact of postwar excavation, MGK also swiftly convert what the 1947 Central Commission Report described as a pit filled with chloride of lime "close to the eastern limit of the camp" into a lime pit close to the eastern limit of the camp’s burial area, to then speculate that grave # 4 (the largest grave in the camp with a surface area of 1,575 m² and an estimated volume of 6,819.80 m³, see Table 7.2), which contains lime (as does grave # 3), might have resulted from a 300 m² lime pit’s being "drastically enlarged by various diggings, including those of the commission surveyors." The lime pit is supposed to have been enlarged to more than five times its original area. MGK are obviously grasping at straws. Regarding Chełmno, Mattogno’s main contention against the 2003/04 archaeological investigation is that this investigation essentially confirmed three graves in the area called Plot IV that had been "arbitrarily established before", and that it "could not have been otherwise." In other words, he is accusing the archaeologists who carried out said investigation of having manipulated their findings to vindicate a predetermined result, moreover one that – as he points out later – had not even been based on archaeological investigation. This accusation is not only baseless but also disingenuous, for a closer look at Pawlicka-Nowak’s report about the 2003/04 investigation and a related map, on which the grave boundaries that had been incorrectly assumed before are also drawn, shows that the investigation in 2003/04 led to major corrections in regard to the previously assumed boundaries of two graves, furthermore established that one previously assumed grave area contained no grave, and discovered 11 ash disposal pits that had not been previously marked. For details see Muehlenkamp, ‘Carlo Mattogno on Belzec Archaeological Research - Part 4 (4)’, http://holocaustcontroversies.blogspot.com/2006/05/carlo-mattogno-on-belzec_31.html. Kola, Bełżec, pp.25, 28, 30, 32/33. See Patricia Heberer, "Von der ‘Aktion T4’ zum Massenmord an den europäischen Juden", in: Günter Morsch, Bertrand Perz, Astrid Ley (editors), Neue Studien zu nationalsozialistischen Massentötungen durch Giftgas, 2011 Metropol Verlag Berlin, pp.165-175. Mattogno, ‘Controversie’, p. 52; ‘Controversy’. Ibid., p.53 and Documento 8 on p.70. Kola, Bełżec, pp. 21 to 39. 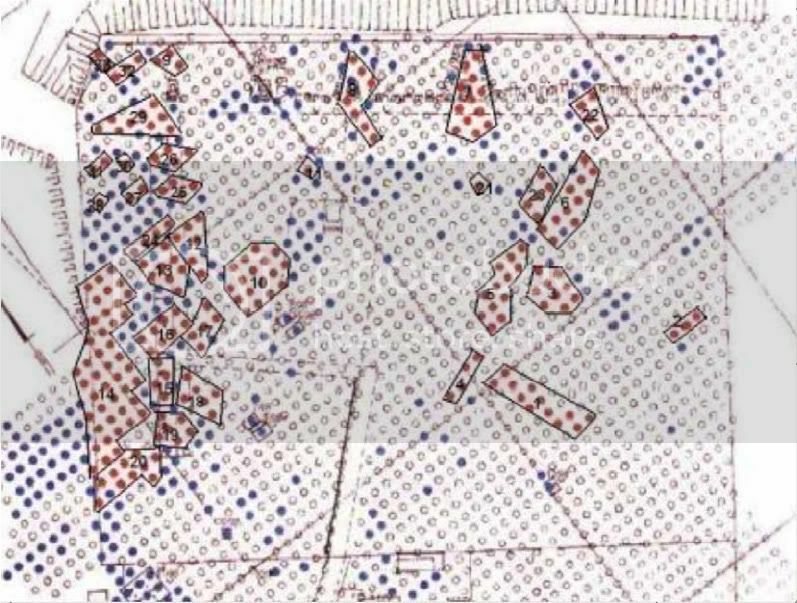 The image resulting from this exercise, which is based on the reproduction of Kola’s core drilling map in Mattogno, ‘Controversie’, p. 69 (Documento 7), is included in Muehlenkamp, ‘Belzec Mass Graves and Archaeology: My Response to Carlo Mattogno (4,4)’. An enlargement of the image is available under http://i27.photobucket.com/albums/c166/cortagravatas/MattognoDocument7edited.jpg. ‘Controversie’, Documento 10 on page 72. Deposition of Heinrich Gley on 7 January 1963; Kogon et al, Massentötungen, p.188 after StA München I, AZ: 22 Js 64-93/61. Thomas Kues, ‘Grave pit enlargement at Belzec caused by soil movement?’, http://www.revblog.codoh.com/2009/05/grave-pit-enlargement-at-belzec-caused-by-soil-movement/. MGK, Sobibór, p.122; citing Schelvis, Sobibor, p.191. Deposition of Franciszek Parkola (head official of Sobibor train station) regarding Sobibor before deputy district attorney Gorgol in Lublin on 05.05.1967; StA.Do Sob 85 PM V NO f. 127 ff.. Parkola mentioned a German from some road-building enterprise who staked out an area of 15 m² and, after having dug through this area (nach Durchgraben der abgezeichneten Fläche), which he called his, extracted several golden objects by moving the soil one [spade] cut deep (einen Stich tief). See Muehlenkamp, ‘Chełmno Mass Graves’.